In 1846 Frank was only eight years old when his father (George) died in SFX, leaving his mother a widow with five children at home. Frank’s only sister (Marie) was married at that time to Charles PELLETIER (1822-1861) and had four children of her own. His oldest brother (William) would have had to assume the role as the family elder and breadwinner at the age of 19. Next oldest was Antoine who was only 14, and Frank was just 8 years old. Their other brothers (Joseph & George) were only 6 and 5 respectively. Immigrant settlers moving west from Winnipeg were finding the land around SFX agreeable for homesteading, and in 1850, Sisters LAGRAVE and LAFRANCE founded a convent in the area. The two Sisters had previously founded the Grey Nuns convent in St. Boniface, and were the first Sisters in SFX. The convent also served as a school for local Métis and native children, housing approximately 25 students in its early days. Frank would have been 12 years old then. 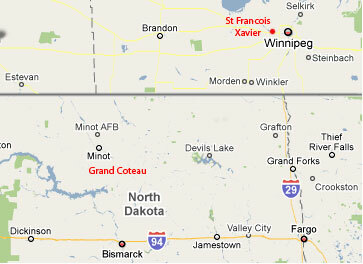 Frank was around 13 years old when the 1851 Battle of the Grand Coteau took place in North Dakota. He probably knew Gabriel DUMONT (1837-1906), who was at this epic battle as a teenager, and would later gain his fame in the Battle at Batoche. Gabriel was about the same age as Frank, a son of Isidore DUMONT (b-1808) who was said to have settled in the SFX area around that time. On July 15, 1854 the famous Métis leader, Cuthbert GRANT (1796-1854), governor of the buffalo hunt, died in SFX. He was 58 years old. From 1854 to 1856Frank was a contract employee (Middleman) with the Hudson’s Bay Company (HBC) (Sprague & Frye). Around 1858 Frank (age 20) married in St Francois Xavier to 23 year old Josephte LAPLANTE, daughter of Magdeleine DESFONDS (Métis) and Jean Baptiste LAPLANTE (born c1815), a French Canadian. As a result of the 1862 Sioux Massacre in the USA, the surviving Indians began crossing the boundary line into the Red River district, causing distress to the settlers there. Because of crop failures, droughts and diminishing herds of buffalo they were starving. These Métis buffalo hunters and the Indians as well blamed their problems on the settlers who were appropriating the best lands and driving the buffalo herds away. Around 1866 Josephine’s sister (Marie LAPLANTE b-1835) married Frank's brother (George FIDLER JR b-1841). On July 1, 1867 the British colonies in North America were united under the British North American Act to become the Dominion of Canada. Sir John A MACDONALD (1815-1891) was appointed as Canada’s first Prime Minister. On Oct 11, 1869, Louis RIEL (1844-1885) placed his foot on the surveyors’ chain to tell them their work was finished! This marked the beginning of another Red River Métis Rebellion. In the fall of 1869, Louis RIEL broke up a survey party, and Métis seized Upper Ft Garry. On Feb 10, 1870 the National Committee of the Métis officially became the Provisional Government, with RIEL as its President. There are endless historic accounts with all of the details of this rebellion so I will not attempt to cover it here. However, when it was all over, RIEL’s Provisional Government accepted the terms of the Manitoba Act andon July 15,1870 Manitoba became the fifth province of Canada, the Canadian Government having acquired the territory previously governed by the HBC. ** Note that many records begin to show Frank’s last name as FIDDLER (with two D’s), and by the time the family was in Saskatchewan that spelling seems to have stuck. On July 15, 1870 Frank FIDDLER was about 32 years old. He was the recognized owner of lot #75 in SFX. At that time his children were Caroline, J Baptiste, Maxime, Francois Jr., Ursule and Catherine. In 1875 both Francois and Josephte (of SFX) claimed their Métis Scrip. In 1877 Patent was taken by well known land speculator Donald A. SMITH. Francois then patented lot #79 in SFX on 20 Jul 1877. In 1879 eldest daughter Caroline married in SFX to Antoine DUCHARME. Census 1881: SFX/Marquette: Francois FIDLER, age 48 (b-1833), French, born MB; Josephte, age 38, French, born MB. Children/ ages: Jean Baptiste, age 19; Maxime 17; Francois 15; Ursula 13; Catherine 11; Louis 9; Joseph 6; Isidore 4; and Moise, age 2. In 1882-83 twenty families from SFX moved to Batoche, SK. 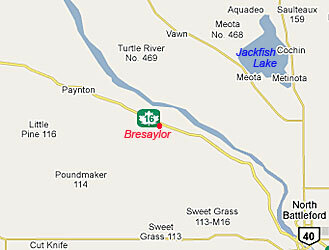 Around the same time al large party of farmers from southern Manitoba moved to an area that was later called the Bresaylor district. Bresaylor derived its name from the three prominent families that settled there, BREMNER, SAYER and TAYLOR. On May 18, 1884 a delegation of four men representing the residents of Batoche (Gabriel DUMONT, Moise OUELLETTE, Michel DUMAS and James ISBISTER) departed for Montana to try to enlist the aid of Louis RIEL in their struggle to obtain justice from the Government regarding their land claims. On June 4, 1884 they visited RIEL at the St Peter’s Mission in Montana, USA. Having agreed to their wishes, the next day RIEL departed for Saskatchewan. In 1884 Frank’s eldest son Jean Baptiste married at Batoche (SK) to Veronique GERVAIS. On March 3, 1885, son Tobie was born in Saskatchewan (possibly at Batoche or near Jack Fish Lake). Much has been written about LOUIS RIEL and The Battle of Batoche. My main source for information was the book The Life of Louis Riel by Dr Peter Charlebois. The first shots of the battle occurred on March 26, 1885 at Duck Lake when “Gentleman” Joe McKAY killed Isidore DUMONT (Gabriel’s brother) and a Cree Indian named ASSYWIN when they approached Commander Lief Newry CROZIER of the North West Mounted Police to “parley”. This began the battle that would last until RIEL surrendered on May 12, and Gabriel DUMONT and Michel DUMAS fled to the USA. Frank FIDLER was 47 years old during the Battle of Batoche. On Sep 7, 1887 Frank received a Land Grant (N ½ of 27-44-1-W3) and in the Census of 1891 he was enumerated in the Red Deer Hill district. Red Deer Hill is located south of Prince Albert and north of St Louis. 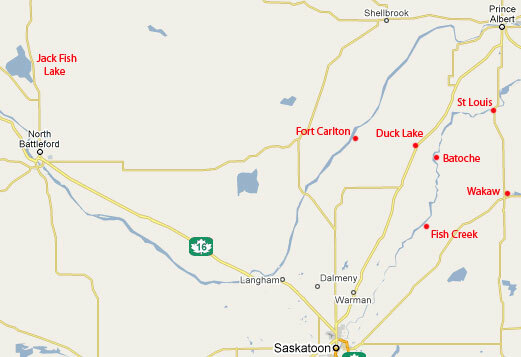 Up-river is Batoche, along the South Saskatchewan River. Children with them in 1891/ ages: Kate, age 20; Louis 18; Joseph 15; Isidore 13; Moise 11; Mary 9; Frederick 7; Toby, age 5. In 1893 Frank filed on their homestead at south end of Jackfish Lake (Meota; NE-34-46-17-W3; 77 acres of which on 30 were above water). He died there that year (Oct 3, 1893). Widow Josephine remained in Meota the rest of her days. In the Census of 1901 she had sons Alfred (age 17) and Toby (age 20) with her; in Census 1906 son Isidore (then age 29) had rejoined them. In 1909 youngest son Tobie married Josephine BOUSQUET in Duck Lake, SK, daughter of Flavie LEDOUX (b-1871) and Baptiste BOUSQUET (1866-1895). The last record I have of Widow Josephine is in the Census of 1911. At that time she was recorded as 66 years old. She was living with son Fred (age 27). I have no record of when she died; obviously it was after 1911 and probably before the Census of 1916 at which she was no longer with son Fred.